That's right! Starting today, the Starlight Celebration festivities are in full effect in all three nations! The city dwellers have brought out their biggest and brightest lights, decorating the streets and buildings in such a dazzling fashion, one might think they were defying the starry skies themselves, kupo! So what plans are on your docket for this year's festivities, kupo? A quiet evening alone with your wishes and prayers under a majestic, starry sky? Ooo, you old romantic! That sounds simply amazing, kupo! A tour of the three nations with a close companion, delving into the finer points of San d'Orian, Bastokan, and Windurstian seasonal ornamentation? Now that sounds like an absolute hoot, kupo! A night full of memories just waiting to happen! What? What? You can tell me! Just you and that special someone nestled up in the cozy warmth of your mog house? Well, whatever plans you may have, one thing is for sure. We moogles have noticed adventurers everywhere are a smidgen exhausted, kupo. It's been a long year of gallivanting about from continent to continent, questing, battling, and whatnot. At the very least we'd like to make the Starlight Celebration a time for them all to get a little rest and relaxation, kupo! We've got a mess of gifts all ready here to help you enjoy this year's holiday season to the utmost, kupo! Time to start handing these things out, kupo! Don't tell me you thought all of these presents were for you, kupo. Come on, where's your giving spirit? This is your chance to experience the joy of being a smilebringer and make the most out of this year's Starlight Celebration, kupo! Let's see what we've got here, kupo...Ah-ha! A little something for that elegant Hume with the glistening gold armor and friendly smile, kupo! And this is for that lovely young Elvaan lady with that gleaming black scythe! Maybe for that gourmet Mithra with the inordinately discerning palate when it comes to rice balls, kupo...? This isn't looking good, kupo. There's waaay too many gifts here to keep track of who gets what. This could prove to be quite the pickle, kupo! There's only one thing to do, kupo! We have to meet each recipient face-to-face to make sure we've got it right! As you may or may not know, we moogles are memory receptacles par excellence, kupo! As soon as we put a face to the name, I'm sure we'll be able to recall what goes where, kupo. That's where you come in, kupo! We need you to go and find other adventurers who may be potential recipients, and bring them to see us. Help us make this the best Starlight Celebration ever, kupo! 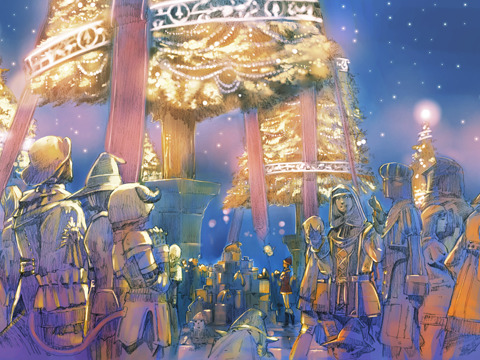 The Starlight celebration will begin at midnight on Wednesday, December 19, 2007 and continue until 7:00am on Monday, December 31, 2007.